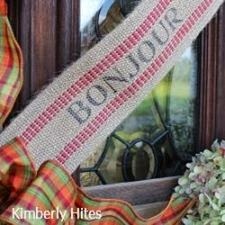 Five fellow bloggers and I are sharing "Fall Around the House" today! In case you missed it, six talented blog friends shared their inspiring Fall decorations yesterday... Make sure you check them out as they are beautiful! Fall is one of my favorite seasons as I love the colors, crisp air, fresh apples, and since moving to North Carolina, it's a wonderful break from the hot, humid summer weather. Since we are just settling into routines after moving into the rental house in August, I'm just now turning my attention to making the house feel like a home and doing a little seasonal decorating. The house does have a small dining room in which I'm able to put my dining bench, trestle table (without the leaves) and a few chairs, but nothing else. I'd say it's about half the size of the old dining room and currently has yellow walls with large variety of holes from previous tenants/owners that I'll be fixing soon. 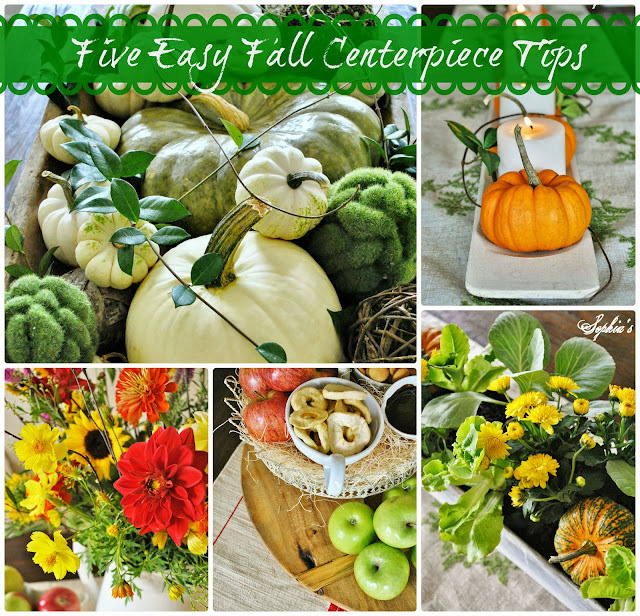 In the meantime, I wanted to share five simple Fall centerpiece ideas/tips that can work in any dining/breakfast room that are as easy as a trip to the local farmer's market! 1. Go Fresh: We all love a bouquet of fresh flowers around the house and whether you love to decorate with color or not, fresh flower centerpieces are always classic. I've found the best flower arrangements for the most reasonable prices at the farmer's markets in both Raleigh and Greensboro. They run $10-$15 and are at least three times the size of the local grocery stores and have much more variety. Check your local market, I doubt you'll be disappointed... I bought the colorful one above for only $6 because it was a day or two old, but if you cut the stems down and add a little flower preserver to the water, it will last quite a while. Also, if you want more height and/or filler for your arrangement, don't be afraid to cut some branches and greenery from your outdoor plantings. I do this with almost every cut-flower bouquet I buy! Once again, I picked up several mini-pumpkins at the farmer's market for just 50 cents each and simply lined them up on my baguette board with some dollar store candles. Add a few vines from the back yard and this Fall centerpiece was less than $10! 3. Fill it up: If you have a large wood dough bowl, tool caddy, or any kind of large vessel for your tabletop...just fill it up with a mix of all-natural elements for a unique, but classic autumn tablescape. I tend to decorate in neutrals so filling a dough bowl (that I got on sale for under $50!) with a mix of green and white pumpkins, moss, vines, and twig balls allowed me to keep it natural, but the green adds just the right amount of color. Once again, the farmer's market is a great resource for all sizes and shapes of pumpkins (beyond what the typical grocery store offers). It's fun to see all the different shades that pumpkins that can be grown! 4. Make it Double-Duty: Make a Fall centerpiece that not only looks decorative, but also serves as a snack station too. Fresh fruit and snacks like dried apples and mini cookies are great for those hungry kids after school and visiting friends! Use any kind of tiered rack, add some excelsior wood filler as well as fresh, crisp apples in all colors and types. Again, the local farmer's market is a great source for a variety of apples and you're supporting your local farmer as well. Don't forget the chocolate and caramel dipping sauces... My kids love to dip their sliced apples into chocolate and caramel! 5. Think Inside the Box: I'm not sure if there has been a time of year where I have not filled my long box with different elements to reflect the season! If you have a rectangular dining table, I highly recommend either making or finding a long box to decorate with the seasons because they are so versatile! Even though I sold my "Family and Friends" box because it was too long for my dining table without the leaves, I have a back-up! I did tuck a few mini pumpkins in until the plants fill out a bit more. It's amazing how much the cabbage and lettuce has grown in the week since I took these pictures! This centerpiece is just a small substitution of the garden I was not able to plant because of moving this past summer! It would also make a great centerpiece for rectangular outdoor tables or just out on the front porch railing. Once again, this is an inexpensive (less than $10) and unique fall table option! I hope you enjoyed the different options of Fall centerpieces that I've made for my home! Decorating for the seasons doesn't have to be expensive or time-consuming... I usually just skip over going to the craft store and head to the farmer's market! Don't forget to check out these five fabulous bloggers today and how they've added "Fall Around the House"! Kristen..I always marvel at the centerpieces you create...they are jaw dropping and make my heart go a flutter! !....I have discovered the local farmers' markets to be the best source of seasonal veggies and flowers too..and I must say that I love, love the simplicity of the row of pumpkins and candles...Gorgeous centerpieces Kristen!!! Kristen,all these ideas are gorgeous. Love the idea of the tiny mums and lettuce! These are gorgeous Kirsten. Thanks so much for this wonderful Fall inspiration. I love all five ideas but my favorite is Line It Up. Thanks for sharing easy and practical ways to create a centerpiece. Five fabulous fall ideas! LOVE them all! What great ideas for any time of the year. You have really struck a cord with me... I'm swooning over those mini pumpkin and starter lettuce and cabbage. How creative. An inspiring fall post! kristen- all of your ideas are just stunning! your photos are great too! Kristen dear, so glad to have you back blogging - glad you are getting settled and hope life gets better soon in G-boro. 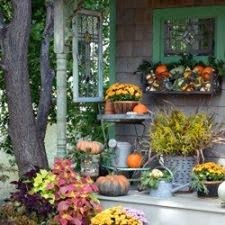 Looks like your creative juices are already flowing though - amazing decor, really lovely Autumn ideas. I'm missing your always great booth at SuzAnna's - nothing compares! Jasmin says to tell you hello - she's still working there weekends, and I have been stopping by. Susie and Jenny did a fabulous Fall Festival one evening recently - perfect weather and a fun time in the entire Vintage Village. We hope you come back to Raleigh at least to visit. I'm off to Central Europe tomorrow with my hubby - hope to see some beautiful buildings and decor in Budapest, Vienna and Prague. Will visit you here on my return. Be happy and hope we meet up again. Beautiful arrangements and vignettes-wonderful inspiration and you are so talented and creative! Visiting from Savvy Southern Style-what a beautiful talent you have for decorating-you have certainly inspired me! Hi Kristen, Thanks for these great ideas! I'm not sure which one I'm going to do first, but I'm going to do several for sure. Thanks for the inspiration. Love your blog. Great ideas. Your containers are wonderful and you were very creative with the different vignettes.Thank you for the inspiration. I am trying to get some energy to gear up and decorate. I love that you used real plants and natural material. Really makes a statement and is stunning. Kristen, thanks for sharing all these great sites and ideas with your readers! Wow - they are all fabulous! My fave would have to be that amazing dough bowl! Thoroughly enjoyed seeing all your decorating tips! Each is just beautiful. each one is wonderful, love all your great ideas for centerpieces. you know how much I loved your long box last year for Autumn, I think it's been pinned a million times! Lovely centerpieces, I love your down to earth crisp style! I have pinned several beautiful photos! All your centerpieces are gorgeous! I am going to have to find a long rectangular bowl of some kind - yours are so inspiring! AAwww... how luvly. All of them are just beautiful. 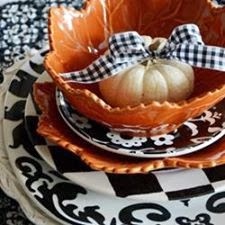 Luv the bowl of white mini pumpkins! Beautiful, I love every detail. I am swooning over the bread bowl. would LOVE to know where you got the dough bowl from ON SALE! Been looking. I'm new to your blog and truly loving it. I just became your newest Follower. You did an outstanding job with the centerpieces. Each one has it's own flair. I've got to see if I can dig up some vines as I love how they added to your arrangements. I host a weekly link party called Seasonal Sundays. I'd love to have link this post! These are all so wonderful, Kristen! It looks like you are making your new house a home :) I sure do envy that pretty bread bowl! Come by when you have time and see my huge harvest basket that I did, which I now have so much more inspiration for after seeing this post!! Love them all, but especially the filled boxes! They are all such pretty ideas, Kristen! I especially like the one planted with tiny mums and veggies -- so lovely! Atlanta Country Living Fair Ticket Giveaway!